MAGNUS (AUS) (Bay 2002-Stud 2008). 4 wins to 1200m, AJC Galaxy H., Gr.1. Sire of 235 rnrs, 157 wnrs, inc. SW Magnifisio (WATC Winterbottom S., Gr.1), Platinum Kingdom, Magnapal, Prince of Brooklyn, Miss Promiscuity, Alpha Beat, The Alfonso, Missy Cummings, Prettyhappyaboutit, SP Gredington, Manageress, Backstedt, Magnus Reign, Malibu Style, Lucky Symbol, Magnus Lad, Pompeius, Aeratus, How Swede it Is, Imprimis and of Duke of Brunswick, etc. Lycka Till (g. by Magnus). 4 wins. See below. Oakdale Winie (f. by Delzao). Winner at 1600m in Aust. MARBLE HALLS (Nassipour). 7 wins from 1400m to 2000m, NZ$1,000, A$936,880, VATC Toorak H., Gr.1, VRC Craiglee S., Gr.2, Turnbull S., Gr.2, BTC Doomben Classic, Gr.3, BATC Rough Habit P., L, VATC Katandra H., 2d Queensland Derby, Gr.1, QTC Sir Byrne Hart S., Gr.2, GCTC AD Hollindale Cup, Gr.2, BTC Labour Day Cup, L, 3d VRC Australian Cup, Gr.1, VATC Underwood S., Gr.1, TS Carlyon Cup, Gr.2, GCTC Prime Minister's Cup, Gr.2, 4th VRC LKS Mackinnon S., Gr.1, BTC Doomben Cup, Gr.1, VRC Blamey S., Gr.2. Jujube (Encosta de Lago). Winner at 1400m, 2d MRC Richfield Lady H., 3d SAJC Morphettville Guineas, L.
Laucala. Winner at 1550m in 2015-16, ATC McGrath Estate Agents H., 2d ATC Bledisloe Cup Festival 2YO P., 3d ATC All Too Hard at Vinery 2YO H.
SLEEK CHASSIS (Flying Spur). Third filly on the 2006-07 Australasian 2YO Classification. 3 wins at 2, A$821,150, MRC Blue Diamond S., Gr.1, VRC Talindert S., L, MRC Allan Wicks 2YO P., 2d MRC Quezette S., L, MVRC Cathay Pacific Airways 2YO P., 3d STC Reisling Slipper Trial S., Gr.2, MRC Thousand Guineas Prelude, Gr.3. Shiner. 4 wins at 1000m, 1200m to 2014-15 in Aust. Red Fire. 4 wins from 1450m to 2300m, 3d MRC John Simpson H.
Baluch. Winner at 1600m, 2d MVRC Sportingbet Best Tote Plus H., Simpson Construction H., MRC (Mornington) A Positive Move H., 3d MRC Le Pine Funerals H., ATC TAB Quaddie H., MVRC Adapt Australia H., 4th VRC Vanity S., Gr.3. Sheridan. 7 wins from 1500m to 3000m, A$88,675 in Aust. Cool Act. 3 wins from 1300m to 2200m in Aust. and China. Indulgence. 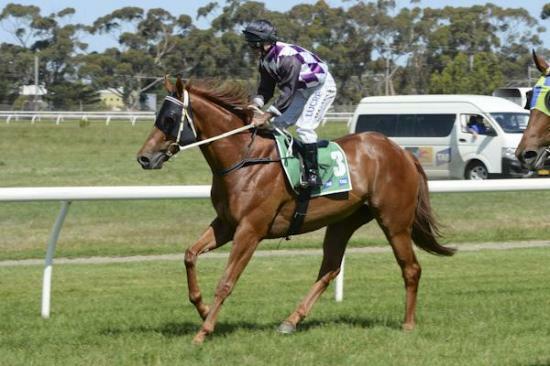 Winner at 1300m in Aust. Queneau - Laugh Out Loud (H.K.). 4 wins at 1200m, 1400m, A$17,250, HK$2,089,325, to 2014-15 in Aust. and HK, HKJC Chaoyangmen H., Macau H., Sports for Hope H., 2d HKJC Tseuk Kiu H., 3d HKJC Vengeance of Rain H.
Sir Toby IV. 2 wins at 1400m in Malaysia. Princess Dehere (Dehere). Placed, 2d Geelong RC Oaks Trial S., L, VRC Seppelt Salinger 2YO H., 3d VRC Anzac Day S., L, 4th VRC Gibson Carmichael S., L, Ottawa S., L. Producer. POWLEY (Noble Bijou). Broadlands Filly of the Year. Third top filly on The 1980-81 3YO Free H. 17 wins from 1200m to 2000m, NZ$139,385, New Zealand One Thousand Guineas, Gr.1, WRC George Adams (Tatt's) H., Gr.1, Southland S.H., Gr.3, Geraldine RC South Island Thoroughbred S., Gr.3, Otago Mannequin S., L, CJC South Island 3YO Championship S., L, Otago RC White Robe Lodge H., L, Dunedin Guineas, L, Southland Guineas, L, Southland RC Ascot Park S., L, Geraldine Challenge S., L, Gore Guineas Trial, L, 2d Wellington S., Gr.3, WRC Thompson H., Gr.3. Race Record: 21 Starts 4-2-5 A$87,285. 4 wins from 1200m to 1600m, A$87,285, to 2014-15 in Aust.